Any thoughts on food supplements? Are you open to them or do you prefer straight meds? I personally hate medicine and only take it when I absolutely have to. I think there's some truth to the conspiracy theory that certain pharmaceutical companies produce substandard meds to prolong your sickness or translate it into something else before curing you to make more money. I'm not being crazy paranoid, it's just business right? They aren't saints. Probably the opposite actually when you think about it. But then again, no. I might pay a visit to my Chinese doctor first for some herbal tea. But that's just me and the kind of person I am. Having said that, hope you better understand my standpoint and where I'm coming from writing about this. I've heard a lot about the benefits of Acai before when I was into juicing. I wanted to get my hands on some but it was difficult to find in our country and super expensive. 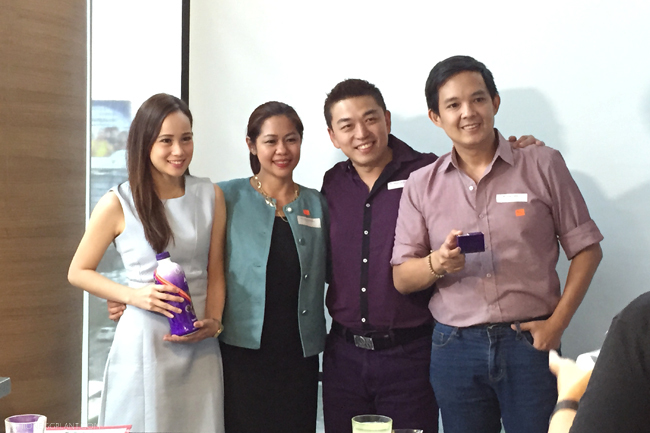 Fast forward to a week ago when I was invited to lunch by my friends at Digital Circles to know more about this new food supplement. Because all people are built differently, what might work for me might not work for you but allow me to share its benefits and my experience with you. That's a handful and I'm sorry if this post has dragged on for as long as it is. I hope you don't find it dragging but coming from someone with chronic stomach pains, I would read and appreciate articles that are complete and precise. SO HOW MUCH and DOSAGE? P2,500/bottle, 1-2 shots/day. Translates to 1 bottle per month per person. Take first thing in the morning on an empty stomach and no liquids or food for at least 20 minutes afterwards. Can mix into a smoothie or add to juice. Kid friendly. 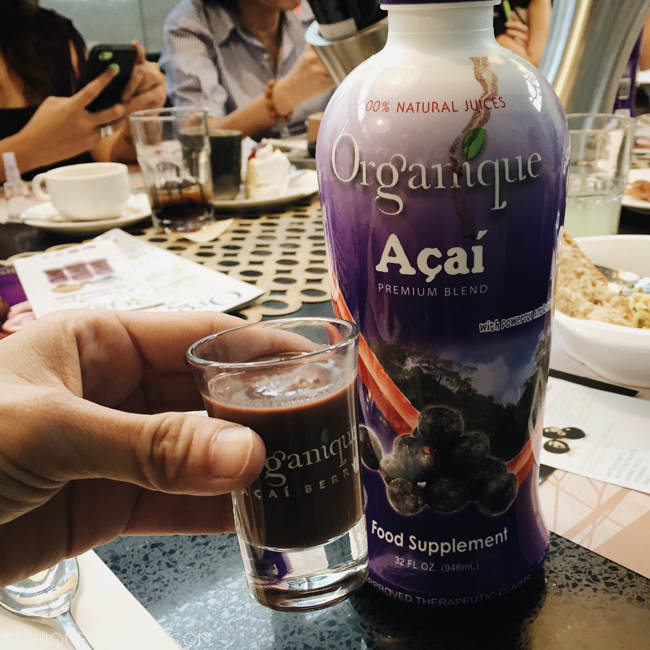 Yes, I know, even I find P2500 quite pricey but before you go out looking for cheaper alternatives, know that the brand ORGANIQUE ACAI is the only USDA-approved Acai Berry food supplement in the market and contains the highest concentration of acai berry. But when you're at that age and state of needing to drink "maintenance meds", P2500 is pretty reasonable and it doesn't attack your liver the same way traditional meds do. According to Diego Castro who was present at the lunch to give his testimonial, drinking Organique Acai helped cure him of his hypertension and he is no longer dependent on "maintenance drugs". For me, I recently realized how much the old cliche "Health is Wealth" statement holds true. Being constantly sick and in pain is not only debilitating but also depressing + you can't enjoy ANYTHING. Money is nothing when you're sick and if spending P2500 month can help me enjoy life more than why not? ORGANIQUE ACAI IS AVAILABLE AT: Mercury Drug, Watsons, Robinsons Supermarket and Pure Pharmacy. Since I started breastfeeding I was wary in taking meds even if some are safe naman. Still diba. Been munching on Acai berry chocolates but I think this drink will be better! I'm going to share this with my hubby. He has hypertension problems too. If this product is going to help him with that, I think the 2.5K will be super worth it! I was invited to Regine Tolentino's event but failed to attend. I am really curious of this Organic Acai. Is it sugar free? I hope it's USDA approved. Been hearing a lot about Acai berries and its benefits. I think it's really worth looking into. Thanks for sharing! Hmm... I also hate medicines, and the way 'some' doctors prescribe it based on how 'doctor-friendly' a pharmaceutical company is.. but let me tell u this sister, whatever product it is, if it has health benefit claims, be sure it's bfad, usfda, or cdc approved, otherwise u can really never be sure about adverse effects.. also, what u said about the conspiracy theory is, well, true only in some aspects.. like, yeah there are drug companies that undergo researches, and there are some who don't, those who don't.. just wait for a certain drug patent to expire first before they can come up with their own version of it minus the studies... thay way their cost is cheaper therefore compromising the standard of the medicine. so better be cautious. So many benefits in such a small bottle, no wonder I have been hearing much about Acai. food supplements have remained to be a staple need for the mommies of our generation, good to hear about Acai. Heard lots of good things about acai. How does it taste? I don't find this post dragging :) It is very informative and I learned about more about acai juice. It used to be just a buzzword for me. I've been hearing about Acai Berry and with the list of benefits seems like worth a try. Sometimes nag ha hypertension ako,lalo na kapag nainom ako ng coffee,hndi na din ako masyado nkkpagexercise,i think this organic bottle can help me,yun nga lng mejo pricey tlga sya,pero kung worth it naman,pwede ko mai try..